Sorry for the late post from Wednesday the internet was not working last night. For breakfast we had cereal and fruit followed by sausage, beans and toast. It was very tasty! After breakfast we went off to do our duties. Most rooms got 10/10 today for room inspections. The lowest score was 8/10. After that it was time for our morning activities. These ranged from orienteering, forest adventures, ropes and biking. For lunch we had vegetable soup and a filled roll. There were mixed feelings about the soup. Our afternoon activities ranged from climbing, caving, canoeing and forest adventures. We had flapjacks for cake oclock and then it was time for free time. People decided to shower, play frisbee, chat and play pool during this time. For dinner we had battered chicken, rice and curry sauce. It was delicious! We then had artic roll and peaches. After that it was time for a quiz around the house. We are looking forward to our last full day tomorrow. Had an awesome last day igloo building, sledging and exploring the forest in the snow. We didn’t manage to write a blog today as everyone was too busy making themselves glamorous for the disco! Everyone is in bed now and we are looking forward to seeing you all tomorrow. This entry was posted in Camp on March 1, 2018 by glindsay. At the start of the third day we woke up at 8am and headed to the dining room for breakfast. Breakfast was sausage, beans, toast and cereal. It was really yummy. Some of us still had bean juice on our faces during our morning activity. After breakfast we had our room inspections. Most people improved their scores from yesterday. Morning activities were really fun but very cold because of the snow and ice. They were orienteering, forest walking, climbing and abseiling, gorge walking, biking, caving and ropes. We were all absolutely freezing so we had lunch to warm us up. We had soup, rolls and biscuits. Then we went on our afternoon activities which were caving, orienteering, forest walk, ropes, gorge walking and biking. It was then cake o’clock and we had jam doughnuts and juice. During free time we had showers (which were hot for once), played table tennis (without a ball) and drew. For dinner we had chicken nuggets, rice and curry sauce. We had artic roll for pudding. It is now time for diaries and the tuck shop before we play cluedo tonight. This entry was posted in Camp on February 28, 2018 by glindsay. Hi everyone! We are all having a fabulous time here. We have no where near as much snow as you guys!! Have tried to upload pictures but unfortunately the internet up here is just too poor. Will share all our photos when we are back. At breakfast we sat and munch on cereal, scrambled egg, bacon and toast. It was quite nice. We cleaned the halls and made our beds ready for the room inspections. Our chores ranged from hooving the hall, brushing the washrooms, emptying bins and rinsing sinks. After room inspections we went to do our morning activities. Each group had a different activity such as ropes, gorge walking, biking, caving, orienteering, forest walking and climbing and abseiling. We came back to the centre and had soup and rolls. Some people came back late for lunch but still enjoyed the munch with their instructor. We did a range of activities in the afternoon such as forest walk, abseiling, gorge walking, biking, caving, orienteering and ropes. At cake o’clock we had flapjacks and juice. After that we played games, some of us chilled and some of us went for showers and were freezing. There were massive queues for the showers. We have just finished dinner which was spag Bol followed by apple and chocolate sponge with cream. We need to go now as we are heading out on a scavenger hunt. This entry was posted in Camp on February 27, 2018 by glindsay. Just to let you all know we arrived safely at Benmore just after lunch time. Some people liked the ferry over but some people did not! We met our instructors and got shown to our dorms where we had a mountain of chores such as making our beds and unpacking. Making beds was definitely an experience! After that we all went on a local explore of the Botanic Gardens of Benmore. During this we saw golden gates, jumped in rivers and learned about different types of trees. When we returned to the centre it was cake o’clock! We then had free time where we could go outside, play games or finish unpacking. After free time it was time for fish and chips. Some of us even went up for seconds! We then had jelly and ice cream from pudding. Now it is time for self reflection through diary and blog writing. We will soon be going on our night walk. We are a mixture of apprehensive and excited. We feel we might need to wrap up warm. This entry was posted in Camp on February 26, 2018 by glindsay. 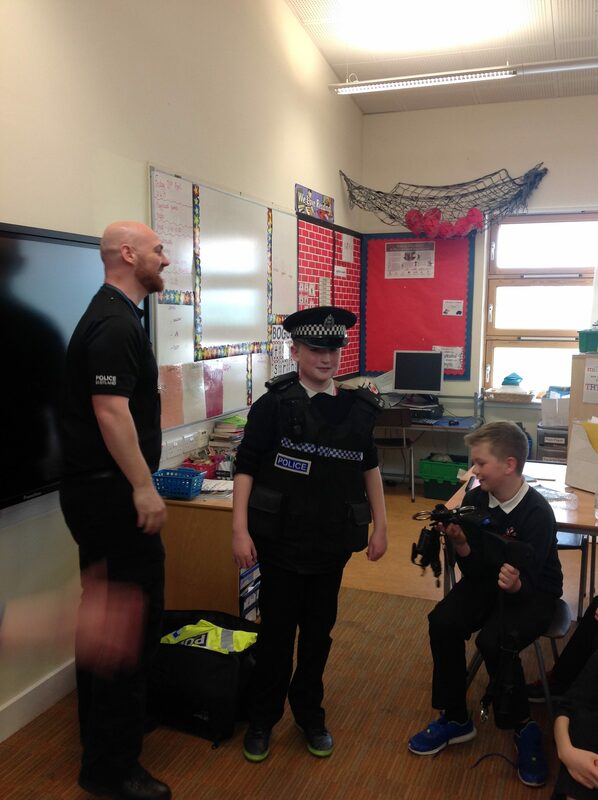 P7A are learning about the world of work just now. 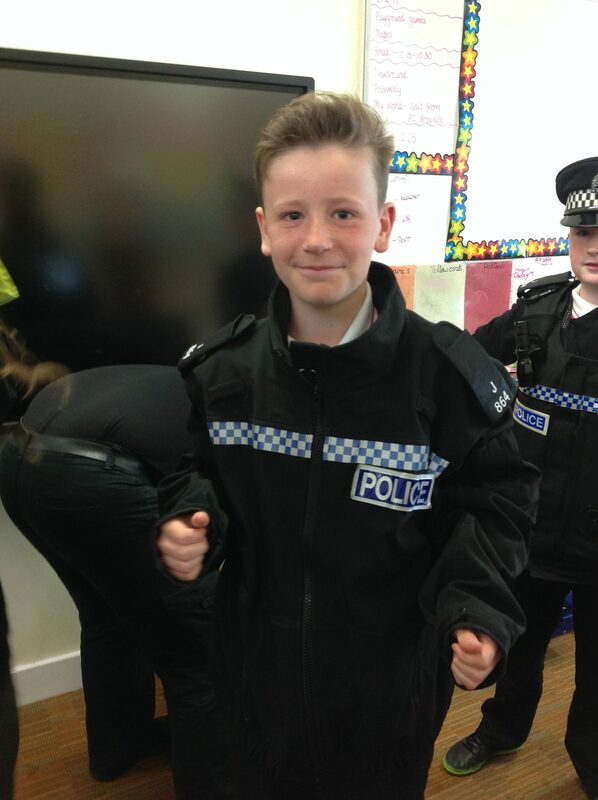 We recently had a visit from PC Brownlee to tell us about a career in the police. We would love if any parents, carers, aunties, uncles, grandparents or anyone else wanted to come in an talk about their own careers. Please get in touch with Miss Lindsay if you would be willing to do this. This entry was posted in P7A Miss Lindsay on May 12, 2017 by glindsay.